Let’s talk for a second about that intimidation factor. I know I’ve said it before, but have you ever come across a dish that you’d die to be able to make on your own, yet that fear of the unknown holds you back? What if said dish takes an insanely long time to make? Or has some crazy involved technique that you have no idea how to do? Well, after forcing myself to tackle things like this Homemade Matcha Pasta and this Whisky Gravlax, I’m very happy to report that this is rarely (if ever) the case. I’m always amazed at how easy something ends up being after I’ve been so afraid to tackle it for so long! 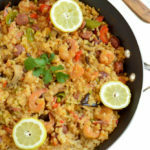 So if there’s one lesson I want you to walk away with by reading this post (besides how to make an insanely delicious Asian Paella,) it’s that the seemingly insurmountable obstacles in the kitchen are hardly ever so at all, so get in there and give a new dish or technique a shot. You’ll not only broaden your “foodie” horizons, but you’ll also both impress anyone you’re cooking for and help them feel more empowered to get in the kitchen on their own and make something out of the norm. Okay, enough preaching! Let’s talk about this Asian Paella. I first came up with this idea after the hubs and I had a date night at a fairly new Spanish restaurant here in Santa Barbara called Loquita. They have a huge selection of authentic tapas and main courses, and everything is served family-style so you pretty much have no choice but to share. Did I mention they also make amazing cocktails? 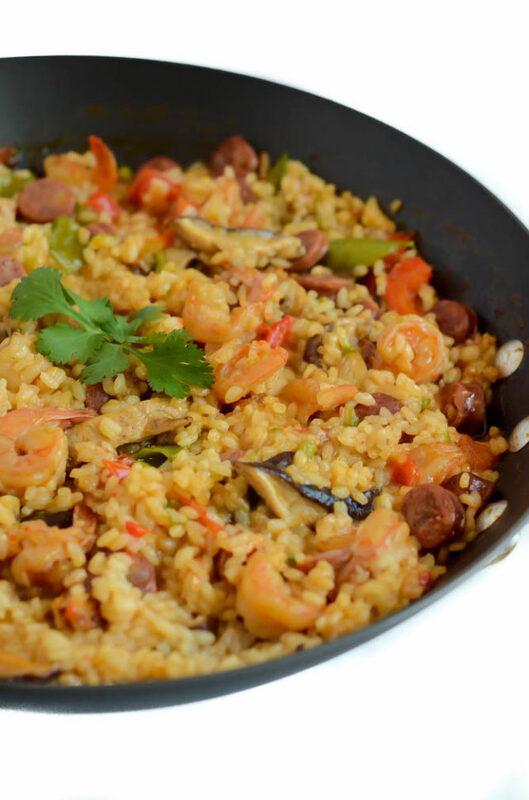 When the hubs and I went there, we decided to keep it fairly simple with just a couple of tapas and one order of paella, which really is enough to serve at least four people (but whoever complained about a few leftovers?) 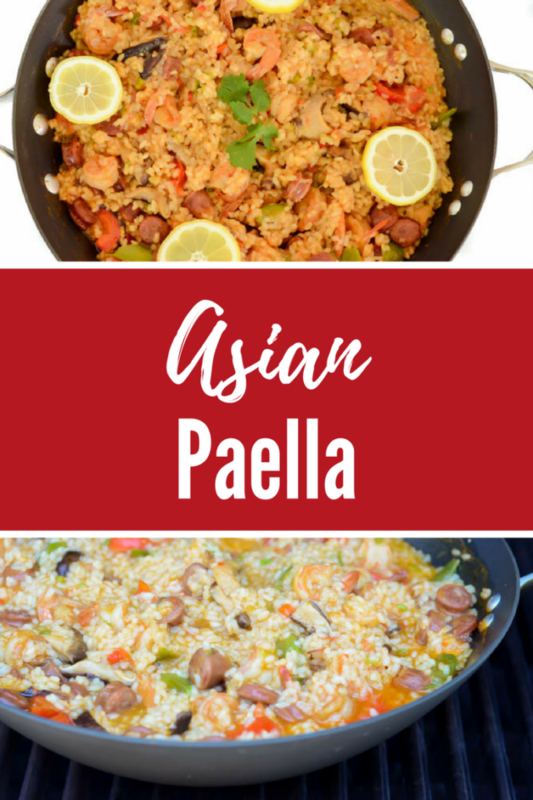 As I started tasting all of the different flavors in the dish – chorizo, chicken, fresh mushrooms and veggies – I realized that I could easily swap in some of my favorite Asian ingredients to give this classic dish a new twist. I used the popular Chinese sausage lap cheong in lieu of the chorizo, and decided to go with easy-to-cook shrimp instead of the chicken. I also made sure to grab shiitake mushrooms and fresh snow peas along with the usual tomatoes and bell peppers. Because I was already using so many strong Asian flavors (namely the lap cheong and the shiitake mushrooms) I decided to keep the seasonings of the paella traditional, using smoked paprika and saffron. 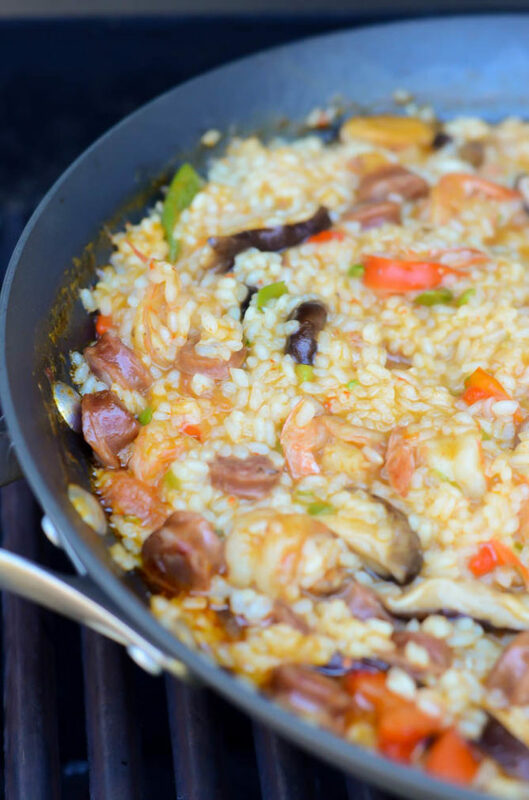 Be sure to use SMOKED paprika (which you can easily find at any grocery store, including Trader Joe’s) as it will help impart the delicious smoky flavor that will make your paella taste like you’ve been cooking it over open coals all day, rather than the gas grill I recommend using here. Also, if you’re hesitant to make the minor investment in very-expensive saffron, don’t be! As you can see from this recipe, a little bit really goes a long way so it will last you a while. As far as the cooking process, I used my trusty Gourmet Today cookbook as my guide and followed their suggested technique of cooking the paella in an oven-proof paella pan (or wok, in my case) over a gas grill. Aside from the appliance that you cook the dishes on, from there the process is much like that of making risotto, if you’ve ever ventured into that territory. You cook the proteins first (here, that means the shrimp and the lap cheong) and then add most of the vegetables. After those ingredients have gotten a good head start on cooking, you add the rice and then the chicken broth, stirring occasionally until the rice has soaked up nearly all of the broth and other delicious seasonings. One other quick note RE: the rice. I did not use the traditional Bomba rice that most paella recipes call for, simply because I was too lazy to track some down and already had some sushi rice on hand, which still worked wonderfully! The only thing I did notice was that it got mushier the longer the paella sat, because it continued to soak up any sort of liquid that was left in the pan. This shouldn’t be an issue if you’re serving your Asian Paella hot off the grill (which is THE best way, I might add) but perhaps stop the cooking process a little bit earlier (before all of the liquid is completely absorbed) if you’re planning on reheating the dish to serve later. The recipe technique I followed in Gourmet said the entire cooking process would take about two hours, and they were spot on. If you ask me, that’s not too intimidating and means that this recipe is still totally doable for any night of the week when you need to serve a crowd. 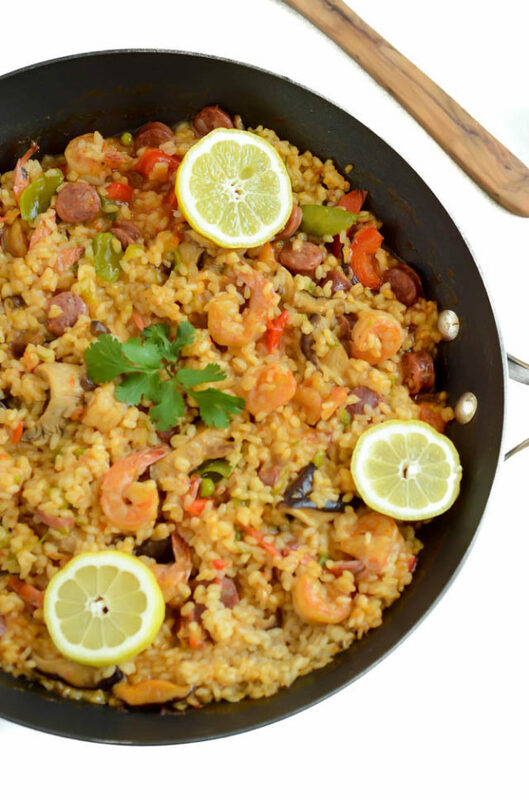 Asian Paella for humpday dinner, anyone? The classic Spanish dish gets an oriental flair with the use of lap cheong, shiitake mushrooms, fresh snow peas and so much more! 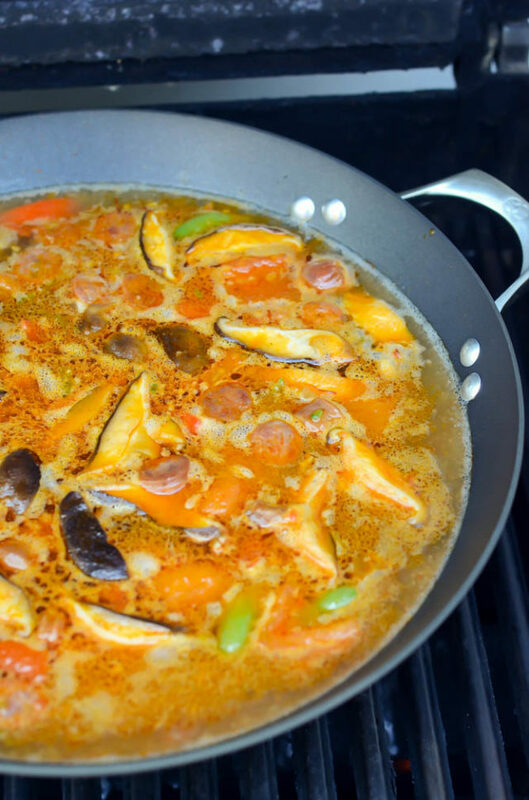 In a large, oven-proof paella pan or wok, heat the olive oil over a gas grill set to medium-high heat. In a medium mixing bowl, combine the shrimp and juice of ½ a lemon and season with salt and pepper. Add shrimp to heated paella pan and cook a few minutes, stirring occasionally, until shrimp begins to turn pink and opaque. Add the lap cheong and continue to cook until shrimp looks mostly cooked through. 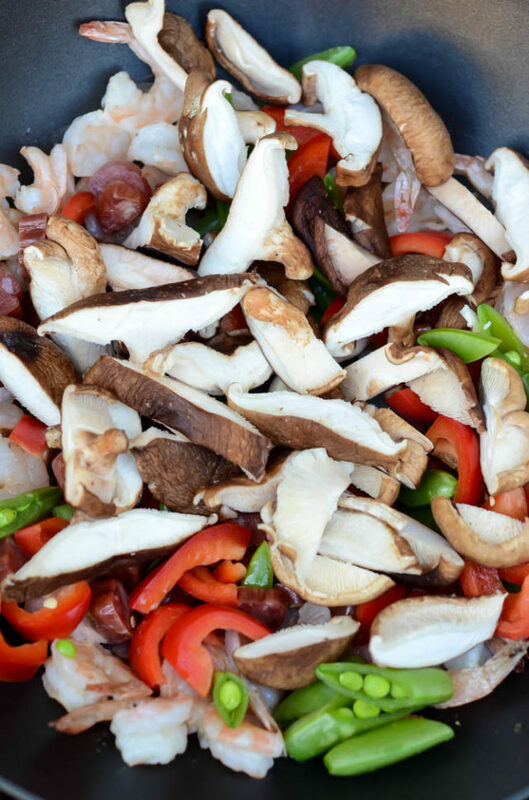 Move shrimp and lap cheong to the edge of the pan and add mushrooms, snap peas and bell peppers to the center. Cook these vegetables, stirring every so often, for about 4 minutes. Add tomatoes, garlic and one teaspoon salt to mixture in center of pan and stir until slightly thickened, about 6 minutes. Sprinkle with smoked paprika and cook, without stirring, for one minute before stirring the proteins on the edges of the pan back into the mixture. Stir in stock and saffron. Turn grill heat to high, cover the grill with a lid, and bring the mixture to a boil. This may take up to 20 minutes depending on your grill. Once mixture is boiling, turn heat back to medium-high and sprinkle rice evenly into the pan. Stir until all rice grains are submerged. Cook for 10 minutes, stir, and then stir. Turn heat down to medium and cook for 10-15 minutes more, stirring at 5-minute intervals, until liquid is absorbed and rice is al dente. Using potholders, carefully remove pan from the grill and let stand for about 5 minutes before serving.